Eliminate the bumpsteer that is created when you lower your car. 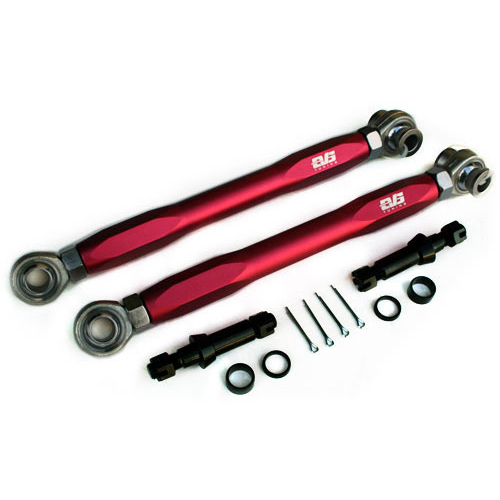 VS Tuning rear toe arms were created specifically for S2000’s with modified suspension. Whenever the S2000 is lowered, bumpsteer is created since the angle of the steering tie rod has changed. You’ll notice that the car will pull left and right without controlling the steering wheel. These rear toe arms help eliminate that potential danger by allowing independent adjustment of rear toe, camber, and arm leveling. After years of experience at the track, the main objective of the design was to increase strength to set it aside from other brands. EVS Tuning rear toe arms are also easily servicable within the U.S. Just contact your authorized dealer for replacement ball joints if needed. There’s no need to buy completely new arms when you can recondition your current ones at a low price. – Steel ball joints with durable, thick M16 x 50mm sized studs.